When death can lurk around any dark corner, humanity's defenders must be ever-vigilant. 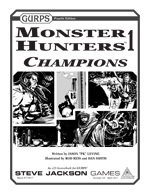 Their story is yours, with GURPS Monster Hunters 1: Champions. Ten high-powered templates for bringing the battle to the brutes and brains of badness. Make psis, sages, and sleuths in mere minutes – building a 400-point hero has never been so easy! Nine new wildcard skills suitable for any cinematic action game – and expanded rules that make them more useful than ever! Master your chosen field with Detective!, Medic!, and more. A completely new magic system – Ritual Path magic – that lets casters try any effect they can imagine . . . with dangerous consequences for those who attempt to do too much. Quick and easy powers – Bioenhancement, Mysticism, and Psionics – that give some champions the edge they need. Six templates for inhumans. Become a "bad guy turned good" as a lycanthrope or outcast angel. A selection of gear to arm the monster hunters. You have to buy the bullets before the baddies can buy the farm! Coupled with the GURPS Basic Set, this pick-up-and-go supplement is all you need to create heroes for any modern-day cinematic supernatural spectacle. The forces of darkness are about to discover that, sometimes, the prey fights back. Greatly expand the rules and possibilities for the Monster Hunters magic system with GURPS Thaumatology: Ritual Path Magic. 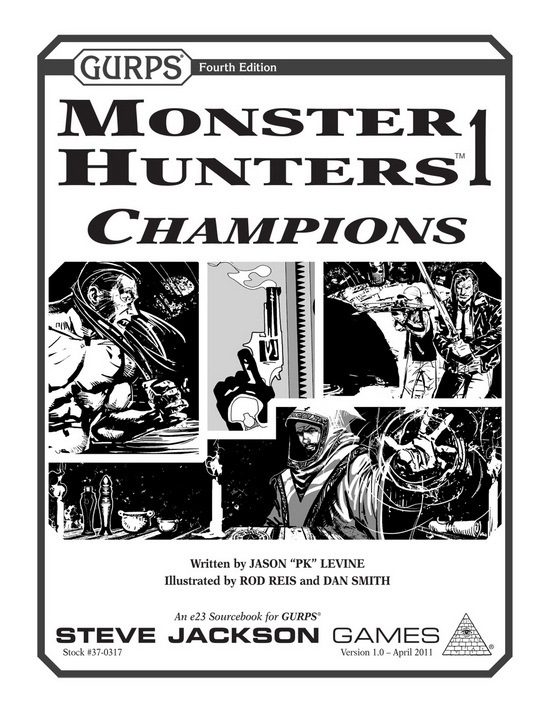 For those who would benefit from more detailed ready-to-use lists of gear, check out GURPS Loadouts: Monster Hunters. For invaluable insight into making your own heroic templates, check out GURPS Template Toolkit 1: Characters. For more complex options for cinematic gunplay, slide across the marble floor with two guns a-blazing and check out GURPS Gun Fu. For more pick-up-and-play GURPS fun, check out the series for GURPS Dungeon Fantasy (old-school fantasy hack-and-slash) and GURPS Action (cinematic real-world action movies). Discover an assortment of new spells and potions using the Ritual Path magic system, in "Magical Tradecraft," from Pyramid #3/48: Secret Magic. Unleash a variant on the techie – the technomystic – along with strange new powers and threats, thanks to "Technomysticism" found within Pyramid #3/91: Thaumatology IV.